Chinese president Xi Jinping is making a stopover on the southeastern Greek island of Rhodes on his way to Latin America, where he is set to pay state visits to Brazil, Argentina, Venezuela and Cuba. There he has met with his Greek counterpart Karolos Papoulias and Prime Minister Antonis Samaras. The two sides agreed to further enhance their bilateral relations. 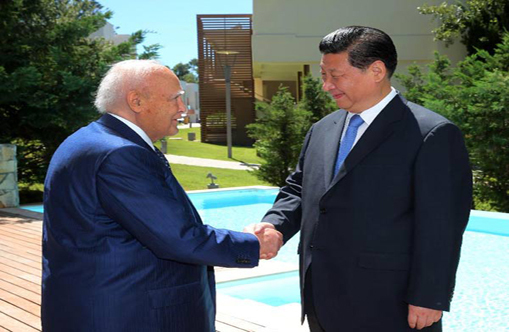 In a meeting with Greek President Karolos Papoulias, the Chinese president said both their countries have unique cultures that have had profound impact on human civilization. And China hopes to increase cultural exchanges with Greece. Xi Jinping also said the Chinese government encourages Chinese enterprises to invest in Greece and improve management of major projects, such as the joinly operated Piraeus port. Papoulias said Greece stands ready to step up cooperation with China, and actively participate in China’s initiatives of building a Silk road Economic Belt and a 21st Century Maritime Silk Road. He also agreed to expand cooperation in maritime affairs and infrastructure building, and welcomed Chinese enterprises to invest in the country. Meeting with Greek Prime Minister Antonis Samaras, Xi Jinping pledged continued Chinese support for Greece on its sovereign debt issues and efforts to promote economic recovery. He voiced support for Chinese companies to actively participate in the technical renovation of Greek railways. Samaras thanked China’s assistance in Greece’s response to its sovereign debt crisis. He also said his country will expand cooperation in communication, energy, environmental protection, technology innovation, and modern logistics.